With software-free operation, cross-platform compatibility, USB 3.0 and high capacities, Secure Key 3 brings a world of advanced data security to your fingertips. This USB 3 SSD drive incorporates PIN access with real time 256-bit AES XTS hardware encryption providing uncompromising security and ease of use. The Aegis Secure Key's FIPS 140-2 Level 3 validation covers 11 areas of cryptographic security including physical security, cryptographic key management and design integrity. Using a rechargeable battery, the Aegis Secure Key enables the user to unlock the drive with a 7-16 digit PIN BEFORE connecting to the USB port on the host system. Since the PIN for the drive isn't entered through the keyboard on a computer, key logger software isn't able to steal the drives PIN. Secure Key 3 can be configured with independent User and Admin PINs, making it ideal for corporate and government deployment. If the User forgets their PIN, the Admin can then clear the forgotten User PIN and set up a new User Pin. The internal drive components are protected by a super tough epoxy compound. This barrier prevents a potential hacker from accessing the encryption circuitry and launching a variety of potential attacks. Aegis Secure Key further protects the data with a programmable "Brute Force Hack Defense Mechanism" which deletes the encryption key and destroys the data if the incorrect PIN is entered consecutive times. 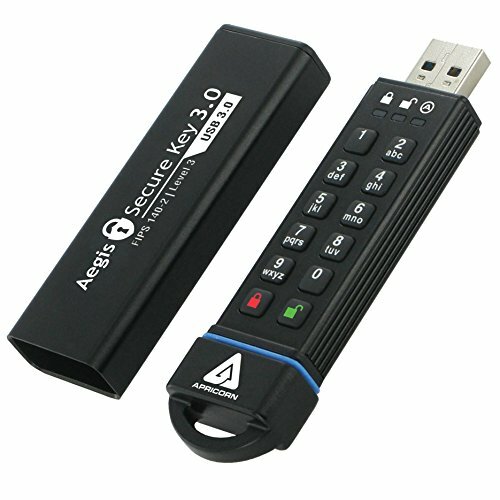 The Aegis Secure Key automatically locks once you unplug the drive from your computer's USB port or when power to USB port is turned off so it can never accidently be left unlocked. Secure Key 3 has several new innovative features not seen on a drive like this before including read only mode, optional self-destruct PIN, unattended auto lock, and a drive reset feature that clears all PIN's and destroys the data. Secure Key 3.0 also has a Lock Override Mode for booting an OS or passing through a virtual machine.